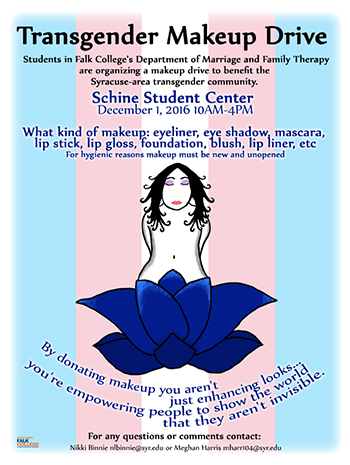 The Falk College Department of Marriage and Family Therapy (MFT) is hosting a makeup drive to benefit the Syracuse-area transgender community on Thursday, Dec. 1, from 10 a.m. to 4 p.m. in Schine Student Center. The drive was organized by Meghan Harris and Nikki Binnie, MFT graduate students on the Trans Team at the Couple and Family Therapy Center, part of the MFT program. Students on the Trans Team received specialized training to provide gender-affirmative therapy for transgender people and their families and assist in the readiness process for medical gender transition. The students from the Trans Team will not only collect these resources, but will also host a workshop in the future to offer a safe environment in which to teach women how to use makeup. “We want to build connections and an extending network of support within the transgender communitym but we cannot do that without the help of allies in the greater Syracuse University community,” Harris adds. Acceptable items include mascara, eyeliner, eye shadow, foundation, blush, lip gloss, lipstick and other makeup products. For hygienic reasons, products must be new and unopened. For more information, contact Harris mharr104@syr.edu or Binnie nlbinnie@syr.edu.